The EU24 is an add-on unit that works in association with a 2420, 4620, 4620SW, 4624, 5420, 5620 and 5620SW. 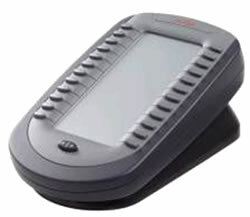 It provides an additional 24 programmable buttons with associated display label and status icons. Only one EU24 unit can be attached to a phone. The alternate EU24BL is an optional backlit version, which is required when adding this module to the 4600 Series models. Each IP Office DS module supports a maximum of two EU24 units only. Connects directly to the associated phone.